My friend Janice is super excited about sharing her weight loss pictures. Janice took Skinny Fiber first and lost 9 pounds; her major change was drinking more water each day. She got off the Skinny Fiber for a few months and felt the weight creeping back on so, she ordered Skinny Body Max and started taking it February 14, 2016. 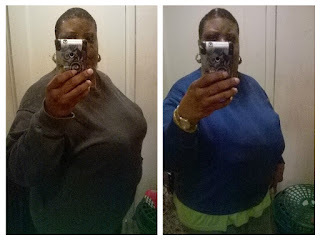 In January she was 264 pounds and now (February) she is 254.8 pounds. "Hello, been on the SBM for about a week, my clothes are looser, i can see changes but the scale hasn't moved much i will send pics next weekend. My sweet cravings are almost at zero. Sometimes i am not hungry when i take the second dosage, like i have to force myself to eat dinner"
"Don't know if you can tell a difference the scale isnt moving much, but my clothes are a lot looser, sleeping better and appetite has changed, some days i am still full when i take the second dosage of SBM ... Started with the regular SF Jan @264 now the scale says 254.8 with SBM about 10 lbs and many inches. I noticed some things that I eat taste very dull now, they don't taste the same as before me taking the SBM, have you have some comments like that. Reese cups are not as sweet, i had a glass of pop didn't have much taste to me, chips are not as tasty"
Janice has done an incredible job!!!! I thank her for submitting her ONE MONTH results ... they are inspiring ... and I am prayerful that she will keep just as she is now! Whether you have a little or a lot of weight to lose, your weight loss results with Skinny Body Max or Skinny Fiber comes with a 90 day challenge website to help you stay on track. It includes tracking for inches and weight lost; free fitness and health guide; how to order more product(s), and info on how to get support when you want / need it, so that you do your best in the weight loss challenge. SEND AN EMAIL or call me if you have any questions or concerns!